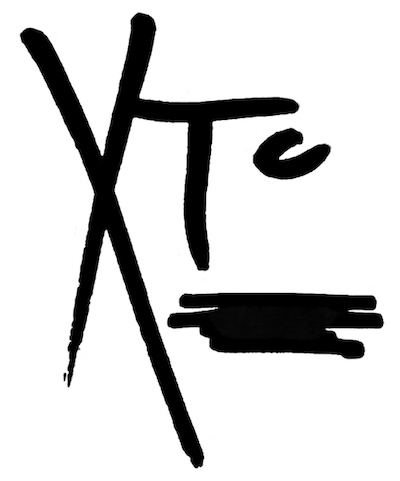 Having a truncated band name like XTC means it’s a gift for ‘logoizing’. And indeed, Swindon’s finest rolled out a succession of corkers over the course of their bumpy-but-brilliant 30-plus-year career. Each one was a nifty visual summation of the musical phase they were going through at the time, from the swirly, Yellow Submarine-esqe lettering of ‘Oranges & Lemons’, to the ancient runic vibe of ‘English Settlement’. Gang of four: a quartet of quality XTC logos (from top left, clockwise): Apple Box (2005, design by Cactus); Oranges & Lemons (1989); Black Sea (1980); English Settlement (1982). But let’s go back to the beginning, when the band’s founder Andy Partridge dashed out a spiky, rough-and-ready rendering of the three letters, which featured on many of the band’s early singles, as well as their 1978 debut LP, ‘White Music’. Mr Partridge is no slouch as a draughtsman. A keen doodler and cartoonist as a kid, he was once gainfully (or perhaps painfully) employed as a sign writer in a Swindon department store. 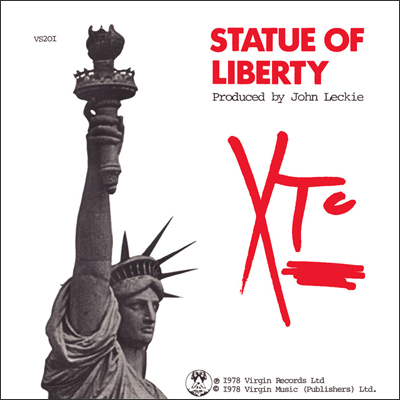 In the red: prominent logo action on XTC’s extremely catchy 1979 single ‘Statue of Liberty’. It was banned by the BBC for a cheeky lyric that made reference to ‘upskirting’ the New York landmark. He’s said: “I thought at one time my career was going to be as an artist, a visual artist. And then at some point I must’ve seen ‘A Hard Day's Night’ and ‘Help!’ and then ‘The Monkees’ series on the TV, and thought, ‘Hey, wait a minute. More girls seem to be attracted to guitars than pencils.’ ” Quite so. Face the music: Brave, bold and beautiful, Jill Mumford’s primitive painting captured the drum-heavy exuberance of the the Steve Lillywhite-produced ‘Drums And Wires’ (1979). You can buy limited-edition giclee prints of the original artwork from her website (link below). Jill Mumford had previously been art director at Polydor Records, but was working freelance when she met Partridge to discuss the sleeve design for XTC’s third album, ‘Drums And Wires’. 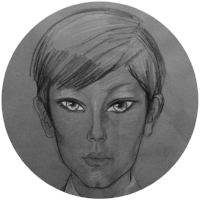 And so, a simple logo became a face, became cover art. The intense, vivid colours were a nod to the heavy,‘tribal’ drum sound that was driving the band’s music at that time (witness the pounding reverse-time opening to ‘Making Plans For Nigel’). But it was also an inspired evolution of the band’s visual aesthetic, taking a few simple hand-drawn letters and transforming it into one of the most memorable LP covers of the era. Fully featured: The XTC face made a reprise in 1994 thanks to this astonishingly detailed cover by BLJB-contributor Rian Hughes. He’s managed to cram in BBC Broadcasting House, a couple of nods to art deco poster artist AM Cassandre, and plenty of references to songs from the band’s various BBC radio sessions. Personal postscript: I first saw XTC in 1979 at Exeter University. Sparse crowd. Guitarist David Gregory ranks this outing among his top six ‘Catastrophic Gigs’ — “appalling acoustics, appalling PA, appalling performance”. The band trudged off stage at the end looking extremely pissed off. The idealistic young me read this as being a bit punk, and I was smitten. I wore a white button badge bearing the first XTC logo on my black Oxfam jacket for the next 12 months.